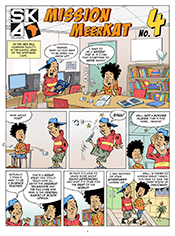 The cartoon series explains how radio astronomy works and why this pathfinder telescope is being built in the Karoo. Includes episodes 1, 2 and 3. Mission MeerKAT by Jive Media is licensed under a Creative Commons Attribution-Non-Commercial-No Derivative Works 3.0 Unported License. 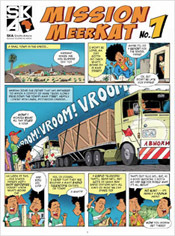 An inquisitive school girl Hannah and the young astronomer Naledi are two key characters in colourful comic books developed by the SKA South Africa to engage children (and their families) in the story of the SKA and MeerKAT. A real meerkat also features prominently, along with an adorable bat-eared fox – both animals found in the Karoo. 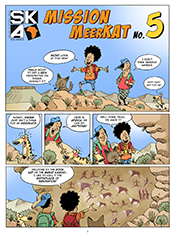 The stories are set in and around a small rural town in the Karoo and help readers to understand how radio astronomy works and why the pathfinder telescope and the majority of the SKA will be built in the Karoo.